I thought I had it all sorted at least as far as priming my miniatures was concerned. I’ve been using the same water based primer from International Paints for over ten years with great results. The quality of the primer I use is important to me as I’m one of those who subscribes to the “paint is not a primer” school of surface preparation. This was £4.58 from B&Q (UK). It’s a good size and a good price. There was one rather strange problem. The 750 ml can says you can clean your brushes in water and that the paint is low VOC (Volatile Organic Compounds). The 250 ml can says you need to use a brush cleaner or white spirit and that the paint is high VOC. This implies the paints are different and I really didn’t want to use white spirit to clean my brushes. The gent at B&Q kindly opened both a 250 & a 750 ml tin for me and both primers looked and smelled the same. After contacting the manufacturer I can confirm that both tins contain the same product and it is water based (low VOC). Consistency & coverage - the paint is smooth, well mixed and had not separated in the tin. It covered the test figures really well. Drying time – a thin coat dried in minutes just like acrylic paint. I left it 30 minutes before applying a dark undercoat. The primer did not lift. Adhesion – once dry the primer withstood all my attempts to rub it off with the pad of my finger. It also withstood harsh treatment with an old toothbrush. As expected, it could be scraped of with a fingernail or sharp knife. The latter is no different to my previous primer. Brush cleaning – all primers are tough on brushes but I was able to use water (with a touch of washing-up liquid) to clean my brushes without any problems. Thinning – when new the primer does not need thinning. However, I usually decant some into a small glass jar. This is more convenient and ensures that a tin lasts a long time. My previous primer tended to thicken with time when used this way and I suspect this one will too. I needed to know if I could simply add water to counteract this; I can. The primer can be thinned with water and doesn’t separate. Colouring – I don’t like a white primer as I use a black undercoat which works better over a grey primer. I added cheap black acrylic paint to a sample of the new primer without it affecting its consistency or its ability to cover figures. The manufacturer said that the product can be tinted to a pastel shade with their tints but were unsure about adding acrylic paint. Desk Life - the only thing I haven’t been able to do is test how long the decanted and coloured primer will last in its glass jar. It could dry out really quickly between priming sessions. I can’t tell yet as I’ve only had the primer for a few days but as the paint is water based I suspect it won’t dry out that quickly and if it shows signs I will simply add a few drops of water. The only real issue I can see is colouring. I think this will be OK for two reasons:  the technical specialist didn’t really know the answer and was just being cautious and  I’ve not had any problems with the previous brand. Of course if I run into problems I can always use it as supplied with two thin coats of back undercoat. Overall, it looks like I’ve found a replacement. Fingers crossed. Any thoughts on putting this through an airbrush? 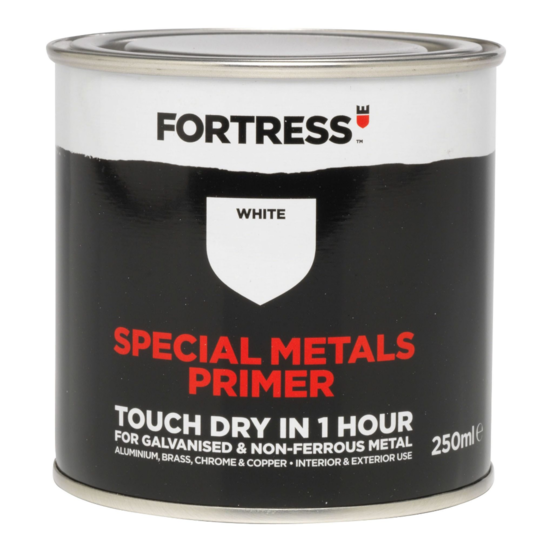 Glad to hear you have found a replacement primer. Hi Tamsin - I think it's too thick to spray and diluting it may be counter-productive but I'm sure their technical people would be able to help you. Hi, I've started using water based brush on special metals primer after reading your blog. Mine is red ( only color in stores) but it shrinks somewhat whole curling. Is a thin layer ok for durability it must everything be covered? I find a second layer fills a bit of detail and the manufacturer advice against thinning the produkt. A thin layer will be fine but everything should be coated. I find it helps to really work the primer into the detail first and then brush off any excess. As to thinning I'd experiment. Two thin layers should work. Any idea how I could get this in the U.S.? I can get Hammerite on Ebay, but it only comes in red, and I really want to try priming in white. It works flawlessly (I tested it against several other primers - by the way, Rustoleum Special Metals Primer was no better than Wal-Mart spray primer). It clearly exists as Amazon used to sell it in the USA. Try contacting the manufacturers for a local stockist. This primer from Dunn Edwards might be worth experimenting with.